We report a unique case of extensive papilIomatosis of the left buccal mucosa in an 80 year old female patient. We document and discuss the probable multifactorial etiology of the lesions and the possible involvement of a syndromic association. This report illustrates the need for careful clinical investigation and follow-up of individuals presenting with multifocal involvement of papillomas. The analogy between photography and X-ray images are reflected both in the public ideas of realistic and exact representations of reality and in what may appear to be quite the opposite: the experience of both the photographic and the X-ray image as a fascinating display of life, of the ghost as spectacle, of something haunting. Like photography, X-ray imaging may in other words be seen as a technique of visualization that represents a mixture of different modes of looking. X-rays were believed to be a sort of super-photography that could prove the existence of immaterial substances, the materiality of things heretofore unseen. Radiographic identification markers are a legally binding form of identification used for radiographic examinations. The objective here is to give a definitive and reliable marker in the form of a negative that can be superimposed on an x-ray film and help finding the true identity of the patient. Non-dental features including race and gender can be used for identification. Clinical diagnosis in Dentistry in particular Oral Medicine is depending on the judgemental and analytical aspects used by a clinician. Symptomatology and diligent utilisation of clinical and laboratory skills forms an essential part of the process of diagnostic sequence. 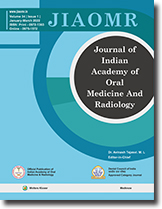 This paper tries to ponder upon the use of the above two to the optimum for proper diagnosis in oral medicine. The odontogenic keratocyst has been the subject of great interest ever since Philipsen introduced the term in 1956. Investigations continue into the lesion's pathologic classification, diagnosis and biologic behavior. Considerable controversy exists regarding the proper management of these lesions - conservative or aggressive?. Here we report two cases of large odontogenic keratocysts of the mandible which were treated by aggressive surgical approach. Stereognosis is the ability to recognize and discriminate forms Oral stereognostic ability has been studied in different reports The experimental design of the test is of primary importance as both the method used and the material applied may influence the results dramatically The form, size and surface characteristics of the test piece , the presentation order, subject related factors and method of scoring all have their effect on the results Edentulous subjects usually show a decreased oral stereognostic ability. A number of questions have been addressed, especially with regard to the perception itself. The following review tries to deal with these questions and attempts to provide clear guidelines for further research on oral stereognosis. The "informatics revolution" in both bioinformatics and dental informatics will eventually change the way we practice dentistry. This convergence will play a pivotal role in creating a bridge of opportunity by integrating scientific and clinical specialties to promote the advances in treatment, risk assessment, diagnosis, therapeutics, and oral health-care outcome. Bioinformatics has been an emerging field in the biomedical research community and has been gaining momentum in dental medicine. This area has created a steady stream of large and complex genomic data, which has transformed the way a clinical or basic science researcher approaches genomic research. This application to dental medicine, termed "oral genomics", can aid in the molecular understanding of the genes and proteins, their interactions, pathways, and networks that are responsible for the development and progression of oral diseases and disorders. As the result of the Human Genome Project, new advances have prompted Nigh-throughput technologies, such as DNA microarrays, which have become accepted tools in the biomedical research community. This manuscript reviews the two most commonly used microarray technologies, basic microarray data analysis, and the results from several ongoing oral cancer genomic studies. Malignant Peripheral Nerve Sheath Tumor [MPNST] is an extremely rare tumor affecting the oral cavity. It refers to sarcomas that arise from nerve or display features of neural differentiation. Here we present a case of 30-year old male patient with MPNST of right side of the mandible. There was a family history of neurotibromatosis in this case. Histologically, pleomorphic spindle cells with wavy nuclei, light stained cytoplasm, and mitotic activity were observed. The clinical presentation, radiological findings, and light microscopic findings are described in detail. The criteria for diagnosing these tumors and recent advances for diagnosis have also been highlighted. Oral malignant melanoma is a rare disease. Amelanotic melanoma is a subtype of cutaneous melanoma with little or no pigmentation. True AMM are rare and there may be some pigmentation at the periphery of the lesion. Amelanotic melanomas represent about 2-8 % of all malignant melanomas. The Clinical Diagnosis of Amelanotic melanomas can be difficult as these lesions may mimic different benign and malignant melanotic and nonmelanotic lesions because of their lack of pigmentation. Amelanotic melanomas often are diagnosed in advanced stage and have poor prognosis. The dental clinician must therefore carefully examine the head, neck, and oral cavity, and any pigmented lesion that exhibits growth potential must be biopsied. Early detection of melanoma is an indication for radical treatment and may increase the survival rate of patients with this disease. "Eagle syndrome" is caused due to elongated styloid process. Generally it is asymptomatic, but on occasions it can cause severe physical and psychological trauma to the patient. Current article reviews about this innocuous syndrome with detailed insight of the anatomy, embryology, theories involved in its elongation (ossification), clinical and radiological features and its surgical management. Oral melanomas are rare entities, accounting for 0.2 - 8% of all melanomas. They carry very serious implications in terms of risk to the patient and poor response to treatment. There is higher incidence among the Japanese and Asians, with peak age of occurrence above 40 years and increased male predilection. The most common site of occurrence being the palate and maxillary gingiva. The prognosis of this lesion is dismal. Five-year survival rate being 10-25% and survival after metastasis is 6 months. A retrospective study of the cases of primary oral melanoma, which reported to the Out Patient Department of Govt Dental College, Trivandrum was carried out. The features of this lesion discussed, highlighting the need for biopsy of even very small hyperpigmentations occurring in the oral cavity to aid an early diagnosis and improve the survival chances of such patients. Squamous cell carcinoma (SCC) arising from odontogenic cyst lining is rare. The exact incidence of carcinoma arising in odontogenic cyst is unknown, but it is estimated to vary between 1 and 2/1000. The pathogenesis is unknown, but a long-standing inflammation and continuous intracystic pressure have been suggested as possible causative factors. Metastasis from these lesions is not common (< 20%), and most of the carcinomas are moderately to well differentiated. To qualify as a primary intraosseous carcinoma, there must be no initial connection with the oral mucosa, overlying skin, or antral or nasal mucosa. This paper presents a case of primary intraosseous carcinoma arising from odontogenic keratocyst in the anterior mandible with metastasis to left parotid lymph nodes. Nevus of Ota is a rare dermal melanocytosis. 2 case reports of this rare leson is reported in Indian patients. Foreign bodies are deposited in the oral cavity either by traumatic injury or iatrogenically. Among them, the commonly encountered are restorative materials like amalgam, obturation materials, broken instruments, needles etc. Few reports of glass pieces embedded within the mouth have been published. We report a case of glass pieces lodged in the lower labial mucosa for duration of 20 years with peripheral reactive bone formation.